The Empowerment Works can assist individuals with making positive lifestyle and health related changes in a number of areas. 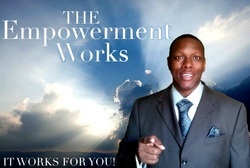 The Empowerment Works is directed by Marvin V. Roane, Marvin utilizes his unique ability to relate to people to assist clients in determining their goals. He is able to transform a personal vision and make it reality. He works closely with his clients to uncover the hidden obstacles which sabotage their intentions for desired changes. The Empowerment Works can help YOU create a personalized plan of support that is tailored to meet your very specific needs and goals.The key to the transformation and uncovering process is his utilization of the Empowerment Coach System and the PEACE Life Management Program.